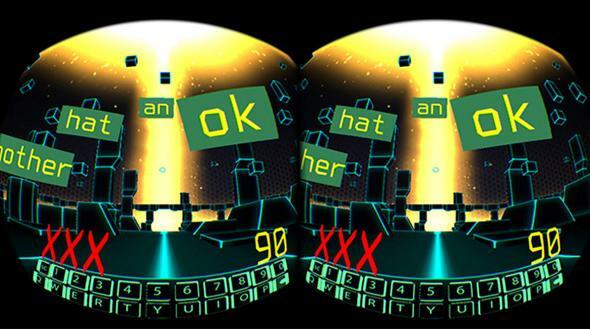 A typing game from Lab Coat Studios in virtual reality for the Oculus Rift. Should We All Be Learning How to Type in Virtual Reality? Everyone learned typing in school. If the mention of Mavis Beacon, Type to Learn, or Typing of the Dead makes you yearn for a simpler time, feel free to ride that wave of nostalgia for awhile, because your archaic typing fantasy is about to be shattered. Ready? Now you can learn how to type in virtual reality, no ghost hands required. You keep your hands in position over the keys the whole time and don’t have to move them off to control the game, so you can stay oriented pretty easily. And commenters seem to be enjoying the functionality, like typing “start” to start and “quit” to quit. Typing may seem like a strange application for VR, but someone has to feed our insatiable and unexplainable appetite for typing games. In the meantime: Type Racer, anyone?